Bok choy is a green in the cabbage family, and is common in Asian cuisine. 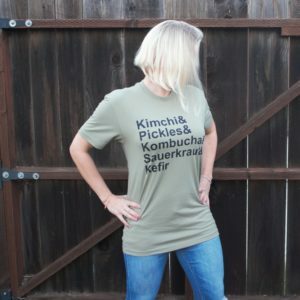 It has a delicate flavor and slightly softer texture than other types of cabbage. 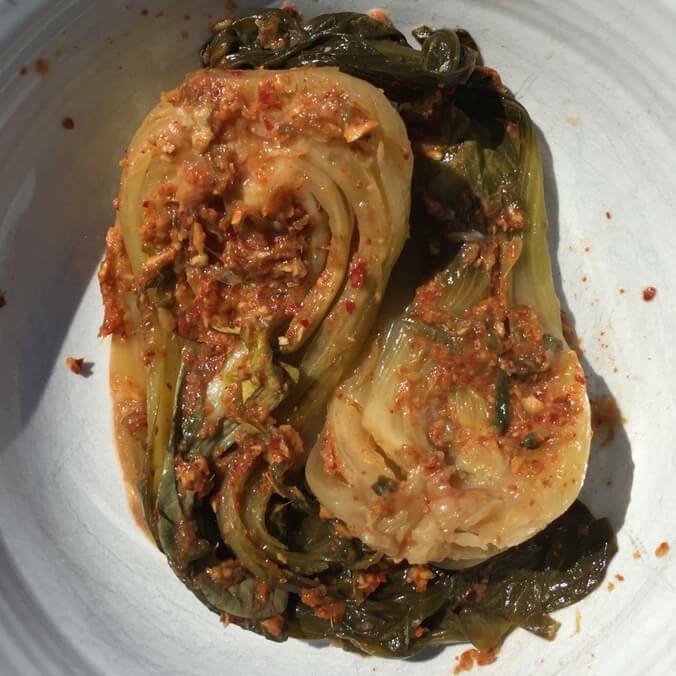 I prefer young (baby) bok choy in this recipe, but the more mature variety will work fine, too. 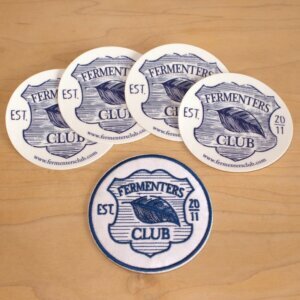 The finished product is packed with vitamin C and other nutrients created during the fermentation process. Rinse dirt off bok choy. Slice in half lengthwise, preserving the stem so the leaves stay together. 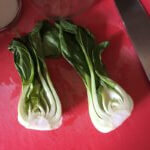 If using full size bok choy, cut into pieces 4 to 5 inches long. 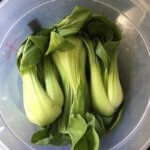 Place bok choy into a container large enough to hold brine. Add a weight on top. 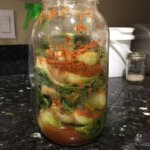 Slowly pour brine until it covers bok choy. Soak in brine for 2 hours. 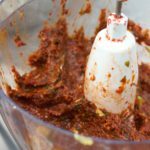 Start the food processor, and mix together until a thick paste forms and it "rolls" together when the machine is running. You may need to scrape down the sides of the bowl once or twice. 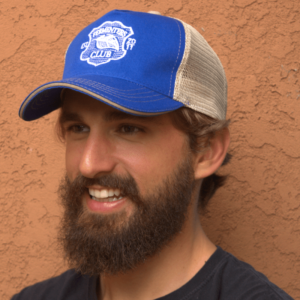 You may adjust with a splash of tamari or soaking brine to get the right texture. 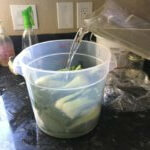 Drain bok choy from brine, reserving ½ cup (200 ml) of brine. 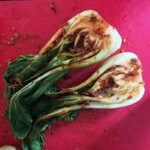 Wearing gloves to protect hands from being burned by hot pepper, coat the bok choy with paste. Pack pieces into a wide-mouth quart-sized or larger glass jar or crock, leaving at least an inch or so from the top rim of the jar. 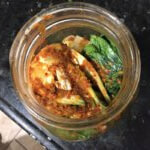 Add remaining paste to jar/crock. 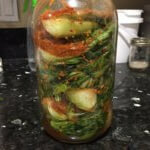 Apply small-batch fermentation tools (add weight and secure jar with airlock). 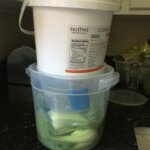 If not using fermentation tools, add a weight on top of the veggies which will keep the contents beneath the brine.The goal is to keep veggies submerged under brine during fermentation. Cover container with a swatch of cloth (not cheesecloth), a dish towel or tea towel to keep flies and dust out. Secure with a twist tie, elastic strap or rubber band. 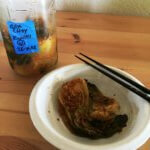 If using mason jar, you can secure the cloth with the metal ring. 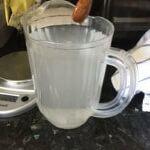 Initially, there may not be enough brine to cover entire contents. The bok choy will continue to soften during the first day. Check after 1 day. Add reserved brine as needed to completely cover the contents. 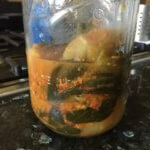 Remove weight and lids and transfer to a jar with a tightly closing lid. Store in refrigerator. Enjoy within 1-2 months.